Jessie Cakes Diary – Page 2 – Bringing you delicious traditional bakes with a twist! Inside out? What does that mean? Based on the reaction I’ve had from friends and family, I’m guessing you’re probably thinking the same thing! Well let me explain…sometimes you just don’t have the time (or patience) to pipe beautiful swirls of frosting on top of your cupcakes. So why not fill them with it instead! ‘Inside out’ making sense now? The perfect Easter bake made simple… ‘Melt in the mouth’ carrot cake cupcakes, studded with walnuts and sultanas and filled with a creamy baked cheesecake center. Now the cupcake recipe may require a fair few ingredients but don’t be put off by this, the method itself is actually really straightforward. Mix the dry ingredients in one bowl, mix the wet in another, pour the wet into the dry and mix together. Chuck in the walnuts, carrots and sultanas and stir. Spoonful of cake mix, spoonful of cream cheese, top with more cake mix and bake. As an added bonus, your house will smell amazing during and after! Preheat the oven to 180°C and line a 12 hole cupcake tin with your favourite cupcake cases. 1. Start with the surprise filling – Mix together the cream cheese and granulated sugar until smooth. Set aside to use later. 2. Now for the cucpcakes – In a large bowl, mix together the sugar, flour, baking powder, spices and zest of the orange. In a separate bowl, mix together the eggs, vanilla extract, oil and juice of 1/2 the orange. Fold the wet mixture into the dry ingredients until fully incorporated. Now grate in the carrot and throw in the walnuts and sultanas. Fold the mixture together gently until combined. 3. Now to assemble – Drop about 1 tablespoon of mixture into the cases, top with a dollop of cream cheese and cover with enough mixture to fill the cases to about 3/4 full. Finish with a sprinkling of granulated sugar on each cupcake. 4. Time to bake – place the cupcakes into the center of the oven for approx. 18-20, or until a skewer/toothpick inserted into a non-cheesecake filled part of the cupcakes comes out clean. They should feel firm to the touch. Your cupcakes will keep in an air tight container for up to 3 days. A crumbly, spicy ginger biscuit base topped with creamy lemon cheesecake, swirled with lemon curd and decorated with a sprinkle of lemon zest. I’ll let you in on a little secret…this is the first big cheesecake I have ever made, and it definitely will not be my last! No bake, no fuss and only 7 ingredients – this recipe can be whipped up in a flash and is the perfect refreshing desert for any occasion. 1. If you have a loose-bottomed / springform baking tin, use it! It will make your life SO much easier when it comes to removing the cheesecake. 2. Bring all your ingredients to room temperature before mixing – this will make sure your cheesecake is lump free and beautifully smooth. 3. Be careful not to over swirl your lemon curd into the cheesecake, less is more as otherwise you may loose the marbled effect. 4. Chill for at least 4 hours or overnight for best results, and keep in the fridge until your ready to serve. Cheesecake should always be served chilled. Crush the biscuits to fine crumbs (I used a blender to speed this part up) and transfer to a bowl. Tip the mixture into the prepared tin and press firmly down into the base to create an even layer. Chill in the fridge for at least an 1 hour to set firmly. Meanwhile make the cheesecake layer, by whisking together the Philadelphia, sugar, cream and juice of the two lemons, until you have a smooth thick mixture (this may take 3-4 minutes). Spoon the mixture on top of the biscuit base and spread out into an ever layer. Using a teaspoon, dot lemon curd on top of the cheesecake and swirl the mixture together with a knife to create a marble effect. Finish by grating the zest of a lemon on top. Chill in the fridge for at least 4 hours or overnight before removing from the tin and serving. Okay so that may be a slight understatement…you know it’s bad when your team at work buy you a penguin encounter and penguin jewellery for your birthday – best gifts EVER by the way! So when I saw this idea on Pinterest I just could not resist. The only thing is they are way too cute to eat! Fun and easy to make and a perfect recipe for the children to get involved. A delicious treat on their own or use them to decorate your favourite cupcake recipe. I made them for my Oreo Peanut Butter Cupcakes, check out the recipe here. Mix the icing sugar with approx. 4-5 tsps of water until you have a thick but spreadable consistency. Spread the icing on the bottom half of the Oreo in a cashew like shape. Now take a small piece of the orange sugar paste and flatten it out. Using a knife cut a small triangle shape. Place the triangle in the centre bottom of the Oreo. Finally dip the end of the cocktail stick into the food colouring (you’ll only need a tiny bit) and add two eyes. Now isn’t that the cutest sweet treat EVER! Anyone dipped Oreos in a jar of peanut butter before? For me this combo is also a winner and what better way to celebrate it then in the form of a delicious cupcake. For all the Oreo PB lovers out there and for the newbies to the party, this recipe will not let you down..
Chocolate fudge sponge with a secret Oreo biscuit base, frosted with creamy peanut butter icing and decorated with the cutest Penguin Oreos! For the icing/decoration you will need…. 1 pack of Oreos – if you want to transform your Oreos in adorable penguins check out my simple step by step recipe here! Preheat your oven to 180C and line a 12 hole cupcake baking tray with your favourite liners. Place an Oreo in the bottom of each cupcake liner and fill each one with the cake mixture just over half way. Beat together the butter and peanut butter until smooth. Now beat in half the icing sugar, half of the milk and the vanilla extract. Beat in the remaining icing sugar and milk until the buttercream is smooth and creamy. If the mixture feels too stiff add another 1/2 tbsp of milk at a time until you have the right consistency. Decorate your cupcakes with the buttercream (I used a star shaped icing nozzle and piping bag) and finish by placing an Oreo on top. What makes this loaf a winner for me is the texture – light, moist and springy, combined with the perfect balance of sweetness, sour lemon and nutty almonds. By adding lemon zest to the sponge mix and pouring lemon juice over the cake whilst warm, lemon lovers will be in all their glory. Oh and did I mention the glaze? A simple icing glaze reminds me of baking with my Grandma, spreading the retro stuff over fairy cakes and biscuits and decorating them with sprinkles. This time I’ve mixed the icing sugar with fresh lemon juice to add extra tang! Preheat the oven to 180 C / 350 F. Line a 2lb loaf tin with grease proof paper – I use a single sheet a parchment, exactly the same length as the tin, so that it covers the bottom and the two longest sides. Cream together the butter and sugar light, fluffy and almost white in colour. Mix in the eggs one at a time, along with a little flour each time to stop the mixture from curdling. Add in the remaining flour, ground almonds, baking powder, vanilla extract and the zest from the lemon (reserve the juice for later!) and fold together until fully mixed. Transfer the mixture to the loaf tin and bake in the oven for 40-50 minutes until a skewer inserted in the middle comes out clean. If the top of the cake begins to brown too quickly, cover the tin with a sheet of tinfoil. Remove the cake from the oven and poke about 8 holes all over the top. Squeeze over the juice from half the lemon and leave the cake to cool in its tin. Once the cake is cool, mix together the icing sugar and juice from the other half of the lemon until you have a thick but pourable consistency – you may need to add 1-2 teaspoons of water. Pour the icing over the cake and sprinkle over with your favourite decorations. Now if that’s not indulgent I don’t know what is! If you follow my blog then you will know Maltesers are a firm favourite of mine, but for this recipe feel free to substitute them with your favourite chocolate. Next time I’m thinking of adding chopped Crunchie to add a honeycomb twist! First line a 23 cm square baking tin with baking paper. Crush the biscuits to a fine crumb using either a rolling-pin or a food processor. Now melt the butter in short 10 second blasts in the microwave until it becomes a liquid. Pour the butter into the biscuit crumbs and mix until it comes together. Transfer the mix to your baking tin and use your fingers to press the mixture out into an even layer, making sure it fills the corners. Place in the fridge to set for at least 30 minutes or over night. Melt the chocolate in the microwave in short 20 second blasts, stirring in-between. Now pour in the cream and stir everything together until the ganache starts to thicken. Whilst the ganache cools, chop your Maltesers in halves. Add these to the mixture and stir to combine. Pour your filling on top of the biscuit base and spread it out to form an even layer. Place the baking tin back in the fridge for at least another 20-30 minutes. In a small saucepan combine all of the ingredients and stir together. On a medium-high heat bring the mixture to a boil stirring constantly. Once boiling, lower the heat and simmer for 15-20 minutes, stirring occasionally, until the caramel has thickened and turned a dark brown colour. Take the caramel off the heat and leave to cool for 10 minutes. Now pour the caramel over the ganache layer and spread into an even layer. Place the baking tin back in the fridge for at least another 20 minutes. First chop your Maltesers in halves. Now melt the milk chocolate in short 10 second blasts in the microwave and pour it over the salted caramel layer. Finally scatter the Maltesers across the top and press them down into the mixture. Place the baking tin back in the fridge for 10 minutes to set the top layer. Remove from the fridge for 20-30 minutes before slicing into 20 bites. Store in the fridge for up to 3-5 days. Soft and fluffy cupcakes made with fresh seasonal strawberries, topped with creamy vanilla buttercream and decorated with rainbow sprinkles. I going to let you in on a little secret though, these cupcakes were a mistake gone right! After putting them in the oven, I began cleaning up and soon realised that I’d forgot to add the rest of the flour – eeeeek! After panicking and debating whether to take them out of the oven and start again, I decided to cross my fingers and hope for the best. Absolute heaven ❤ These cupcakes are SO light, SO fluffy and perfectly balanced in taste. The days of equal parts butter, sugar and flour are no more! I mixed chopped strawberries and fresh strawberry puree into the mixture to add taste and texture and topped them with my classic vanilla buttercream recipe. Which I’m told from my friend “is just so good… it’s got class!” 🙂 thanks Stef! So let’s get baking shall we…. 200g unsalted butter, I always use Stork as it makes your cakes so much more fluffy. Preheat oven to 180°C and line a 12 hole cupcake/muffin tray with baking cases. Cream together the unsalted butter and caster sugar with a wooden spoon/electric mixer until creamy and smooth. Add the beaten eggs and vanilla extract and continue to mix until combined. In a seperate bowl combine the flour and baking powder. Add 1/2 of this as well as the milk to the butter and sugar mix and fold together until combined. Now pour in the strawberry puree, along with the remaining flour and fold together. Finally add in chopped strawberries and mix until completely covered. Spoon batter into cupcake liners filling 3/4 of the way. Bake for 18-20 minutes or until the tops of the cupcakes spring back when gently touched and a toothpick inserted in the center comes out clean. Beat the butter using a wooden spoon/electric mixer until light, fluffy and pale in colour. Add 300g of the icing sugar and the vanilla extract and beat until smooth. Now add the remaining 300g of icing sugar continue to beat until smooth and creamy. Frost your cupcakes as desired, (I used a medium sized round piping tip) decorate with the coloured sprinkles and garnish each with a strawberry. A healthy recipe for delicious muffins that taste exactly like banana bread. Made using unsweetened applesauce and greek yoghurt instead of butter, oats instead of flour and the additional of cinnamon spice these muffins are naturally sweet, perfectly moist & full of warm spice and you can enjoy them completely guilt free! Plus the recipe couldn’t be easier… simply mix the wet and dry ingredients in separate bowls, combine together before transferring to your muffin tin and bake for 12 minutes. You can make, bake and eat these babies in less than 30 minutes – perfect if you have a sudden sweet craving! Preheat the oven to 180ºC and spray a 12-hole muffin tin with non-stick spray or lightly grease with coconut oil. In a bowl mix together the protein powder, cinnamon, oats and baking powder. In a separate bowl use a fork to mash the bananas. Now add the egg whites, apple sauce, Greek yoghurt and vanilla extract and mix together. Now add the wet ingredients into the dry ingredients and use a spatular to fold the mixture together until fully combined. Divide the mixture evenly between the baking tin holes and bake in the centre of the oven for 12 minutes, until the edges are lightly browned. …these are the hundreds of left over chocolate eggs after our Easter Egg hunt last weekend! And, this was after we had overloaded as many as possible to family/friends/friends of friends/friends of friends of friends! So I was sat staring at the bowl thinking ‘I can’t possibly eat any more chocolate’ and began daydreaming of chocolate recipes. With a family joint birthday party just a few weeks away, I thought what better excuse to make a huge chocolate fudge cake with chocolate frosting – particularly as I could freeze it until the day of the party (more about this in the recipe below). Preheat the oven to 180ºC. Prepare two 8-inch cake pans by first spraying with baking spray or brushing with butter and then lining with greaseproof paper (see below for instructions). Add the flour, sugar, cocoa, baking powder and espresso powder to a large bowl. Use a whisk to mix the ingredients until they are well combined. Now add the milk, sunflower oil, eggs and vanilla extract to the bowl and use an electric whisk set to a medium speed to mix all ingredients together until well combined. Now reduce the speed and carefully add the boiling water bit by bit. **Do not worry if the mixture looks very runny, once baked the cake will be super fudgy and moist** Finally, beat on a high speed for 1 minute to add air to the mixture (little bubbles should start to form on top!). Distribute the cake mixture evenly between the two prepared cake pans. Bake for 30-35 minutes, until a toothpick or cake tester inserted in the center comes out clean. Remove from the oven and leave to completely cool. Once the cakes are cool remove them from the tins and begin making your buttercream. Melt the dark and milk chocolate together in the microwave, 20 seconds at at time stirring in between blasts, until smooth. In a separate bowl beat together the butter and icing sugar with a wooden spoon/electric whisk until fluffy and smooth. Now fold in the melted chocolate until fully incorporated. If the buttercream is starting to feel a little stiff, add a tablespoon of milk at a time and mix into the buttercream to loosen it. Take one layer of your cake and place it on a serving plate. Spread a thick even layer of buttercream on top and then place the second cake layer on top upside down. Now spread a thin layer of buttercream all over the top and sides of the cake and place in the fridge for 30min-1hour to set*. Once set, spread the remaining buttercream across the top and sides of the cake and use an icing palette or blunt knife edge to give a smooth finish. Finally, break up the decoration chocolate into shards and decorate the top of the cake by pushing them into the icing**. *This is called a crumb coat and is meant to be messy, so don’t worry about being too perfect as it will just act as a smooth base for the next layer of buttercream. **I decided to freeze this cake in preparation for a birthday party, so I wanted to quickly share my instructions on how to freeze a cake properly so that it will still taste delicious once defrosted. Firstly, place the iced & decorated cake on a plate and put it in the freezer uncovered until it has completely hardened (at least 4 hours). Now securely wrap the cake in 2 layers of clingfilm, ensuring there are no gaps, and repeat with 2 layers of aluminium foil. The cake will keep in the freezer for up to 2 months. Be sure to defrost the cake for at least 24 hours before consuming. Place your baking tin on a piece of greaseproof paper and draw round the tin with a pencil. Use a pair of scissors to cut it out. 2. Cut out a long thick strip of greaseproof paper about 60cm long and fold one long edge of the strip. Make little cuts along the folded edge roughly 1 inches apart. 3. Grease the tin with a little butter or baking spray and fit the long strip around the inner edge of the tin with the cut edges flat down on the bottom of the tin. Place the circle of paper on top of the cut edges in the base of the tin and flatten down. For the past few years i’ve always baked a batch of cookies for the whole family to enjoy on Easter Sunday, it’s become somewhat of a tradition! 2014’s bake was my Creme Egg Cookie Cups, 2015’s bake was my Mini Egg Easter Nest Cookie Cups and this year is certainly no exception. However for Easter 2016 I’ve decided to strip it back to basics and rework my go-to cookie recipe and so far this one is the winner. I’ve used less butter than my previous recipe as generally in cookies more fat equals flat, crispy cookies and I prefer mine chewy, thick and soft. I’ve also added an extra egg yolk as it helps bind the dough, increase the softness of the cookie and add richness to the flavour. 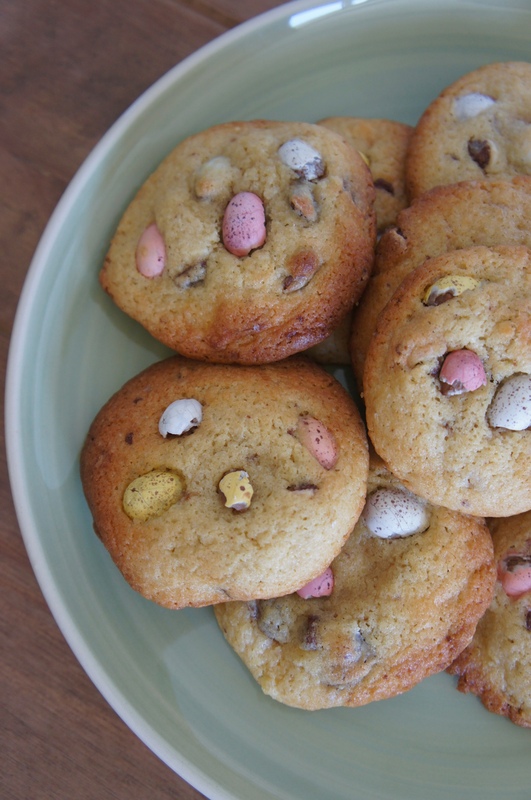 Crushed Mini Eggs have been added to the dough to make them taste Eastery (<—-is that a word!?) 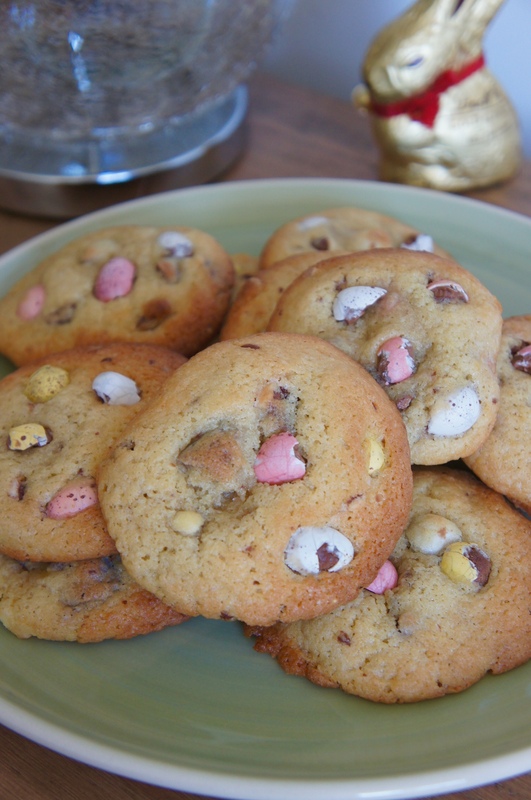 and I also added white chocolate chunks because… well why not, it is Easter after all! Preheat oven to 180°C. Line two baking trays with greaseproof paper. In a medium bowl cream the butter and two sugars together until light and fluffy. Add the vanilla extract, crack in the eggs and mix together (don’t worry if the mixture has split, this is normal!). Add the flour, chopped white chocolate & 100g of the crushed Mini Eggs and fold everything together until all ingredients are combined and a sticky dough has formed. Cover the bowl with clingfilm and place in the fridge for at least an hour/up to 3 days (the longer the better as your cookies will become super soft and chewy). Once chilled, take approx. 1 tablespoon of cookie dough, roll it into a ball and place it onto the baking tray (do not flatten it out as the cookies will expand in the oven). Repeat this for all 12 cookies, leaving roughly 2 inches between each one. 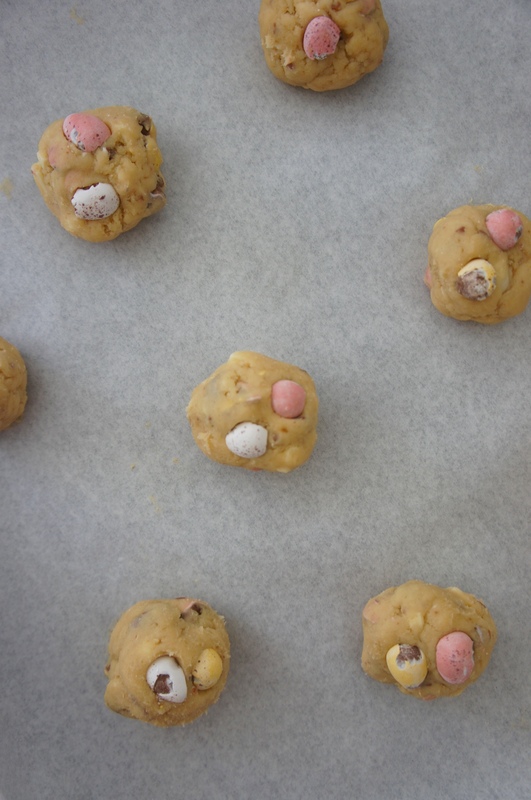 Press the remaining Mini Egg pieces into the tops of each cookie balls. Bake in the oven for 11 minutes until the edges are a light golden brown but the middle still looks pale and underdone. Remove from the oven and leave to completely cool (the cookies will continue to cook as they cool so it’s important not to overbake them in the oven).